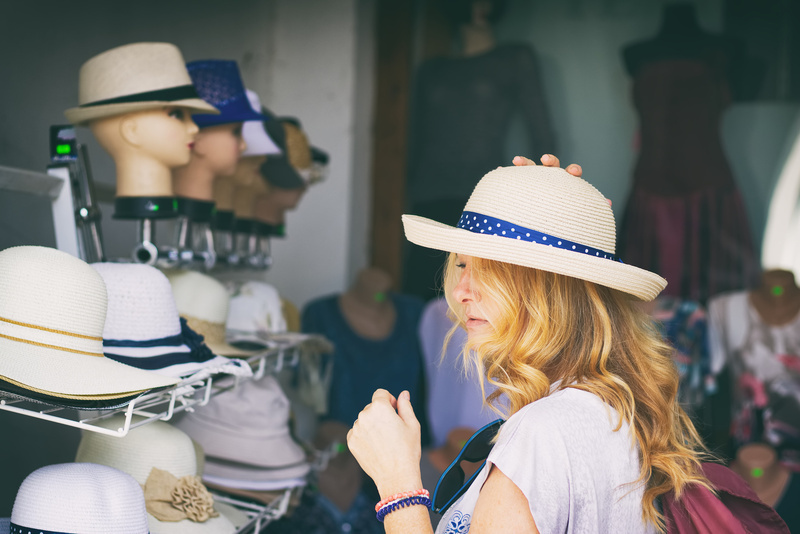 Generally, the term ‘experiential retail’ refers to a store in which ‘stuff’ happens in addition to selling, and shoppers do things besides just buying. In a previous post, I explained it as an experience given freely by a retailer to create some type of value for their customer. It may be educational, technological, emotional, fun, entertainment or it may just involve them trying/experiencing a product. However, like everything, just because it’s ‘experiential’, doesn’t mean that it will be effective at converting sales or engaging your customers. Our moods and emotions have a massive impact on how we see the world which includes how we perceive buying choices. In fact, Harvard Business School professor Gerald Zaltman says that 95% of our purchase decision making takes place subconsciously ‘aka’ through the emotional brain, not the rational/logical brain. While our stores are plastered with ‘logical based thinking’, the reality is we don’t really use these ‘features & benefits’ to make our decisions. Our decisions are much more emotionally charged…well, 95% more actually. So, if you want to win over customers these days, you need to appeal to their emotions. According to a US study done by Smith, some shoppers shift between mindsets, depending on the product category, others use predominantly one mindset. 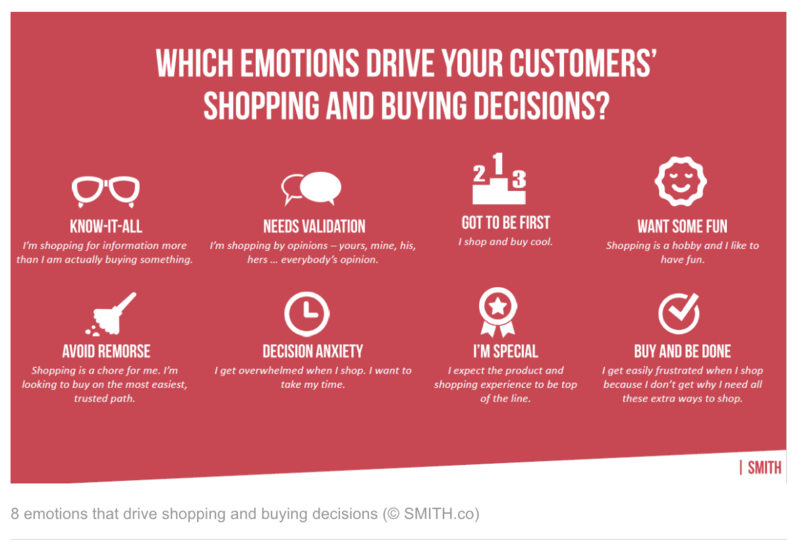 Here’s the 8 emotions they found that drive buying decision. Decision anxiety – 17% – “I get overwhelmed when I shop. I want to take my time. Buy and be done – 10% – “I get easily frustrated when I shop because I don’t understand why I need all these extra ways to shop. Wants some fun – 9% – “Shopping is a hobby, and I like to have fun”. Avoid remorse – 9% – “Shopping is a chore for me. I’m looking to buy on the easiest, trusted path. *%average distribution within North American population. I’m not trying to bombard you with information here. But instead, inform you that customers walking into your store are bound by their emotional states. Innovative retailer leaders need to understand HOW and WHY people shop and buy things. As you can imagine, we all have different retail stores with varying types of customers stepping inside. As you look over the 8 emotions above, how can you help satiate these emotions in-store? If we look at the most significant percentage 20% of customers, who need ‘validation’. In other words, they are looking for opinions on what other people think about a particular product. Of course one of my favourite pastimes when shopping online is to read the reviews of a product I’m about to buy. So personally I can really relate to this. As retailers, we need to think about how we can accomplish this in-store? You can certainly accomplish this through our team – if it was a clothing store it might be a story about someone who just bought this for a Date Night with her husband or that it’s one of the most popular items and it’s selling fast. Similar to the online strategy of, ‘people who bought this like that’ you can verbally select another item you think they might like. Or I’ve even seen signs at Bottle Shops that say, “if you like this, you’ll love ==>”, with a higher quality product next to it. Either way, all of these scenarios will play out differently in your store. So, start thinking about what emotions you want to evoke and then brainstorm how you can achieve that instore.